There is never a sales pitch at Aaron's. Aaron's General Price List is readily available. There are no hidden costs. At Aaron's, flexibility is our middle name. 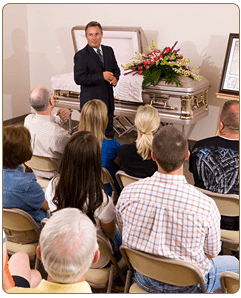 As northern Utah’s affordable funeral services alternative, Aaron’s is prepared to handle traditional chapel funerals either at Aaron’s, a church, or even a park or backyard. As the leader in direct cremations in Weber and Davis Counties, Aaron’s is prepared to discuss those many alternatives with you as well. Aaron’s is experienced with all religious ceremonies and has relationships with all faith communities. Aaron’s is the shipping specialist and is qualified to arrange funerals anywhere in the United States, Canada, and Mexico. Aaron’s will bury in any cemetery and can save you money even if you have a plot in a private cemetery connected with another funeral home.